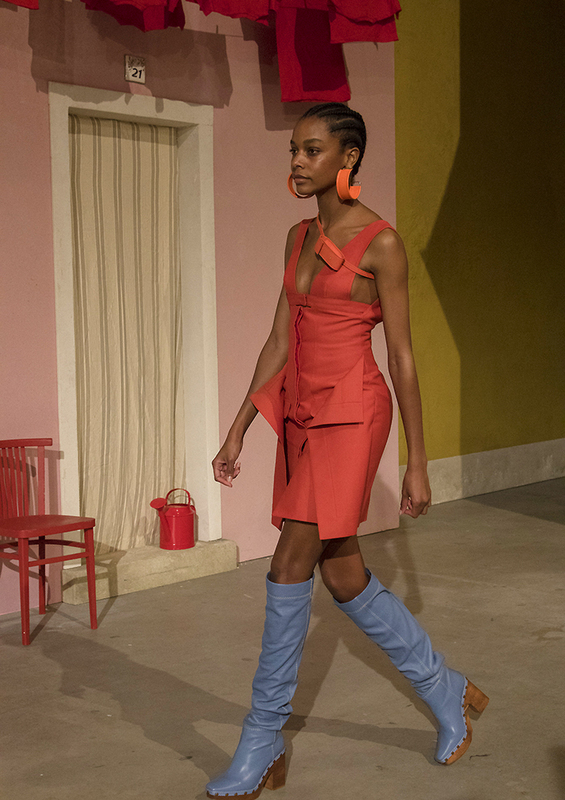 The sci-fi universe of Ottolinger and a skewed take on the denim jacket at the AW19/20 show in Paris. Photographed for DAM by Elli Iaonnou. SWISS designers Christa Bösch and Cosima Gadient used Liu Cixin's Chinese science fiction trilogy, The Three Body Problem, as the starting point for their new collection. 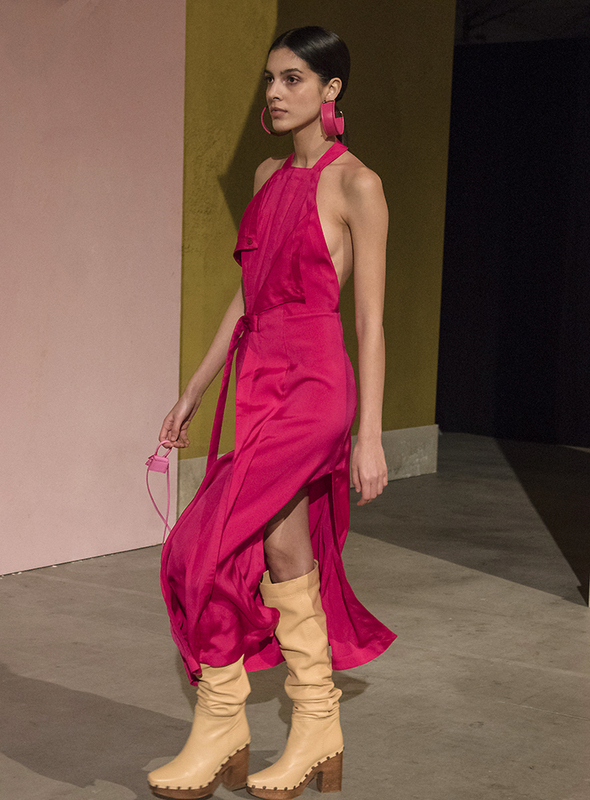 This was the second time the pair, who are based in Berlin and call their label Ottolinger, showed on the official calendar for Paris fashion week. 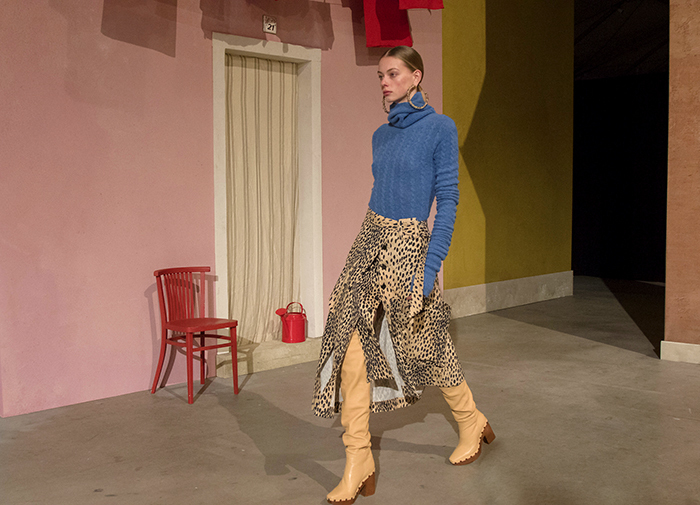 For the new season, they chose the Lycée Jacques Decour, and its 19th wooden century theatre, as the backdrop to the new collection. During the show, a large screen projection, flashing lights and loud metallic sounds were meant to disturb the audience while the models filed past in a collection of distressed, asymmetrical and yet sporty creations. The aim was to create a sense of apocalyptic disorder suggesting that chaos is needed for creativity and innovation to flow. 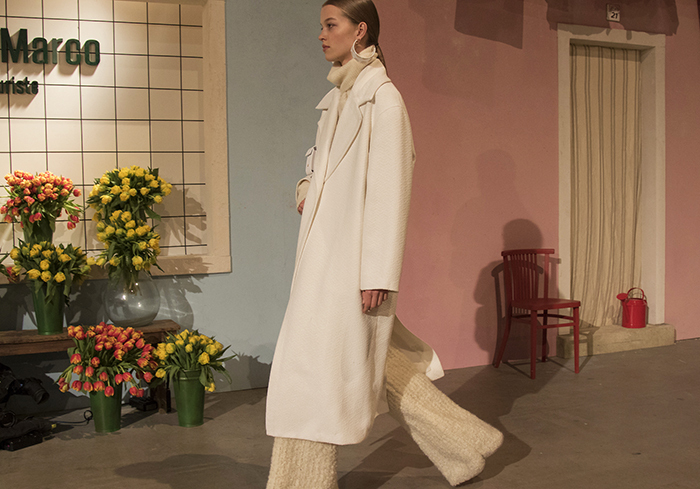 The designers have created a certain ethos for Ottolinger that incorporates asymmetry and ripped fabrics that sit close to the body. Idiosyncratic pieces included skirts printed with photographs of a Swiss folkloric tradition where people wear models of their house as hats at the start of the new year. 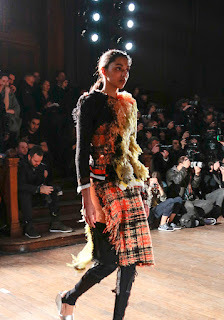 The design duo like deconstruction and experimenting with textiles and the new collection included a mix of plaids, checks, flannel, denim and knits. 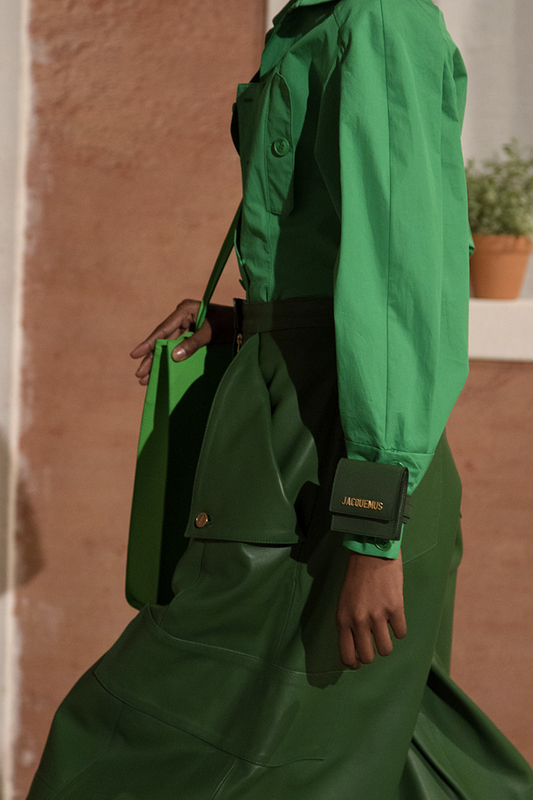 But sportswear is their base from ski looks that seem like space outfits to more tailored pieces such as short tartan twinsets in vivid greens and oranges. On the catwalk there were black, shiny vinyl looks, dresses with ruches and asymmetric cuts, and Bösch and Gadient's experiments with deconstructing tartans and plaids. The designers have said they like to drape on the body to create their designs and this gives the pieces a good fit. Jackets and tops were combined with slender trousers and multiple zippers were used outside as elements to heighten the form of the body. 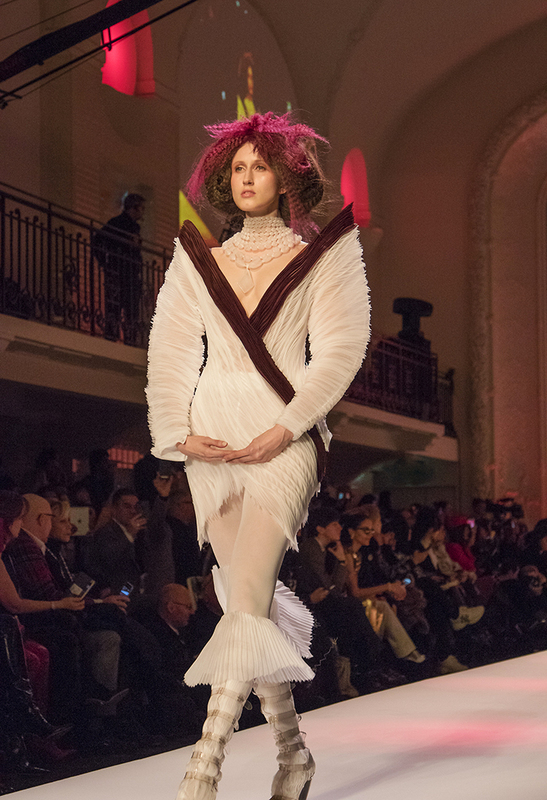 Fabric was bunched up to create skirts and bustiers that managed to look both avant-garde and elegant. The designers like to create beauty from unusual elements and enjoy skewing the angle of jackets and dresses and keeping edges raw. 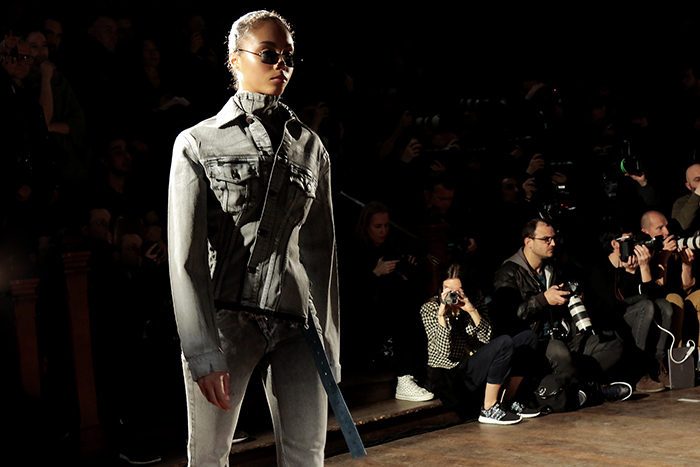 Fantasy is the conceptual part of the show and the futuristic sportswear embodied the designers' vision. They saw this collection as a space opera where the ordinary is combined with the fantastic.The idea of sportswear is taken further this season yet enhances the feminine silhouette such as the green paisley silk looks. The designers' quote from the writer of the Chinese sci fi novel gives some inkling of the oblique way the pair create their collections: “Coming up with a new speculative idea that moves me profoundly. Then I plan out a story around this seed. Finally, I create the characters to serve the story. My method of composition inevitably leads to stories in which the speculative idea is the core." 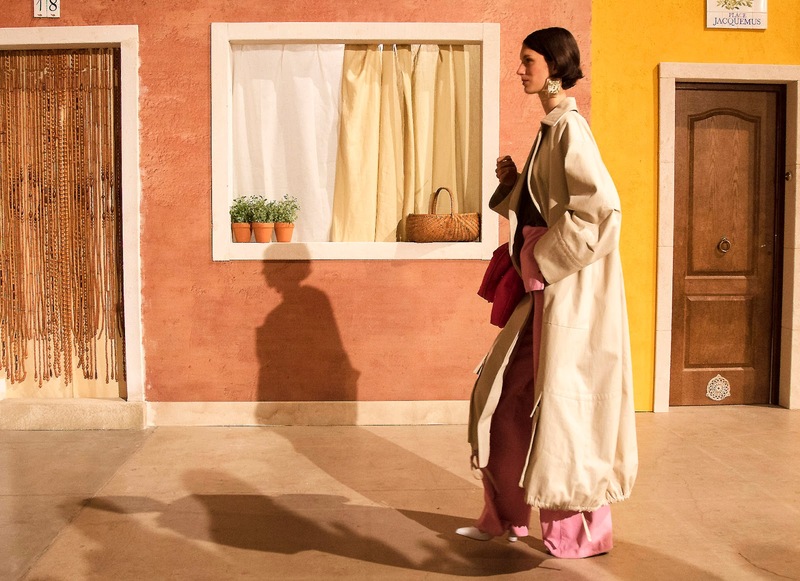 FRENCH fashion designer Simon Porte Jacquemus created a Mediterranean town square with thirty-two pastel-hued houses that looked just like the fishermen's cottages enclosing a little Italian piazza on the island of Burano near Venice. 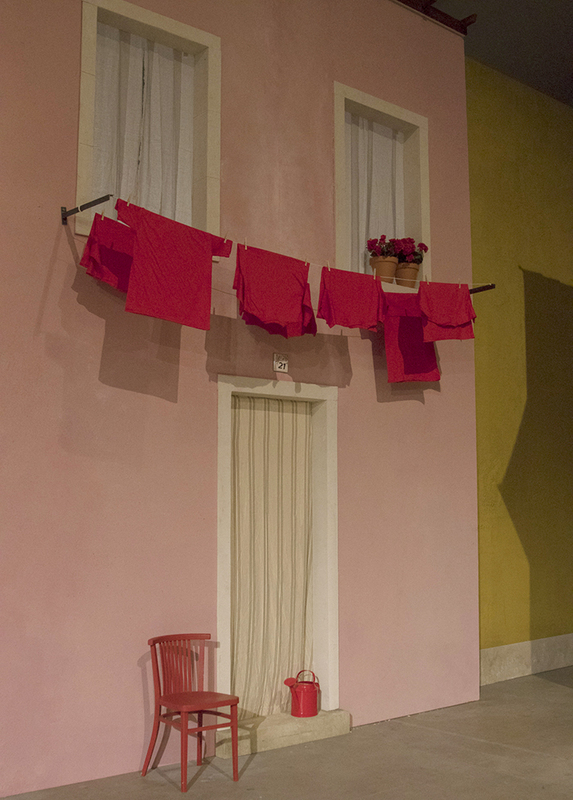 Pot plants, flowers and colourful chairs were outside on the doorsteps, some even had laundry hanging out to dry from the windows. 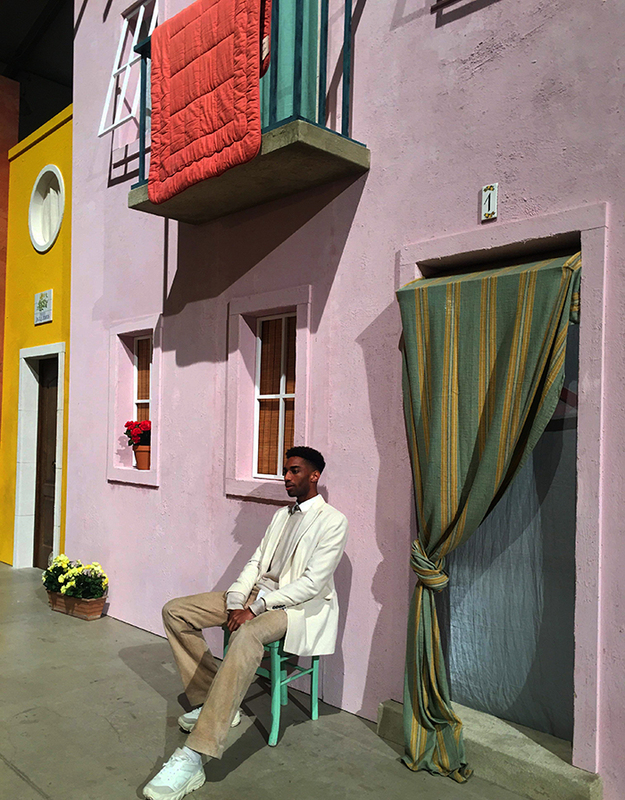 There was a Place Jacquemus with a storefront of Fruits et Legumes, Chez Marco (fleuriste) and a Rue Corbusier. It was atmospheric and captured the warmth of summer, felt especially on a cold, dark Paris night in winter. 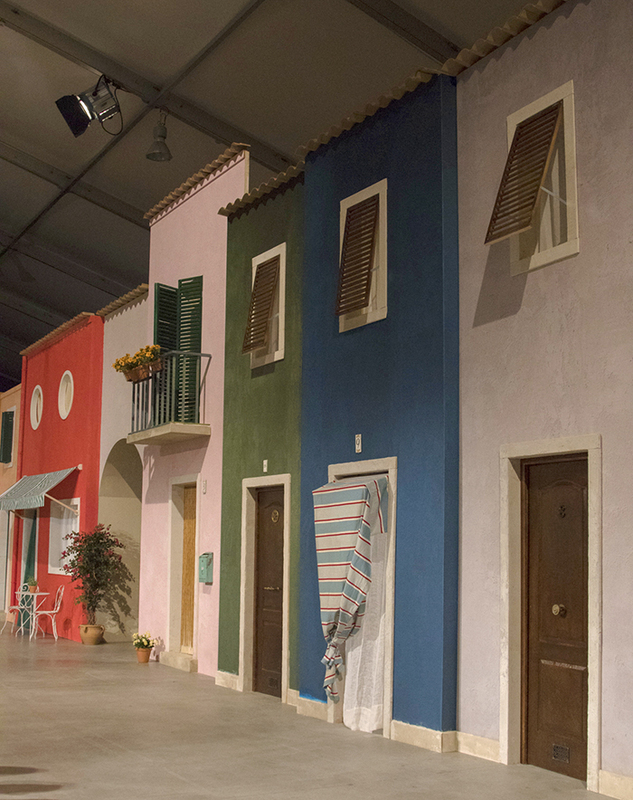 The show was created within a large hangar-like space in the Avenue de la Porte-de-la-Villette, a lane in the 19th arrondissement at the Paris Event Centre on the periphery of the city. In a more modest, yet singularly charming way, the show brought back the memory of Karl Lagerfeld's last, brilliant haute couture show in January at the Grand Palais where he recreated a French garden and villa on the Côte d'Azur. 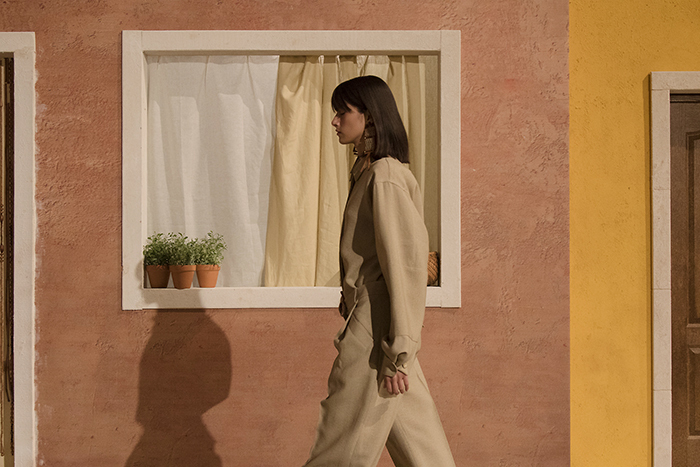 This season, Jacquemus says he wanted to incorporate the line of a Picasso drawing, the colours of his favourite paintings and move beyond his signature South of France aesthetic. 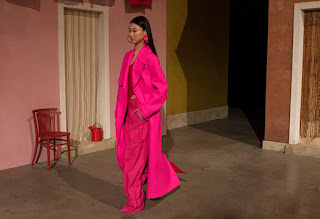 He said he also wanted to mix up the masculinity and femininity of the collection, including silk suits and trompe l'oeil knitwear and add elements of both winter and summer. The designer called the collection La Collectioneuse, inspired by a collector of eclectic objects from Memphis prints to painted jeans. 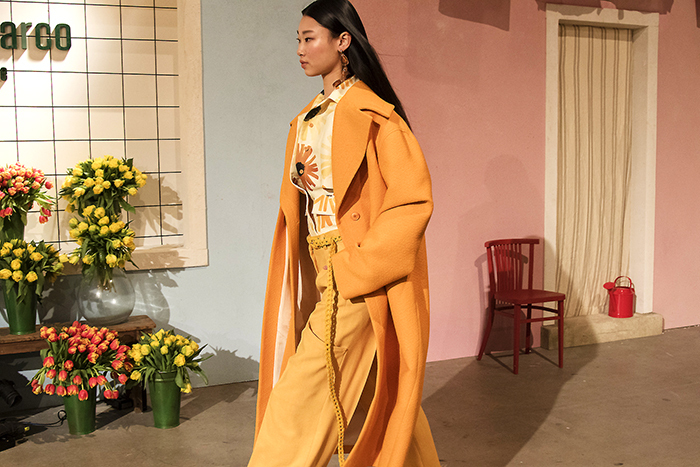 The collection included Seventies style orange culottes, coats recalling his new menswear line, pantsuits, skirt and sweater combinations and jackets with utilitarian pockets for the gadgets we all carry around with us. Capturing the colours of the Riviera were splashes of vivid fuchsia, various hues of orange, emerald green and sapphire sea-blue. There were quirky, crystalline earrings where almonds, nougat and family pictures appeared suspended in clear polycarbonate looking rather like upmarket keyrings. 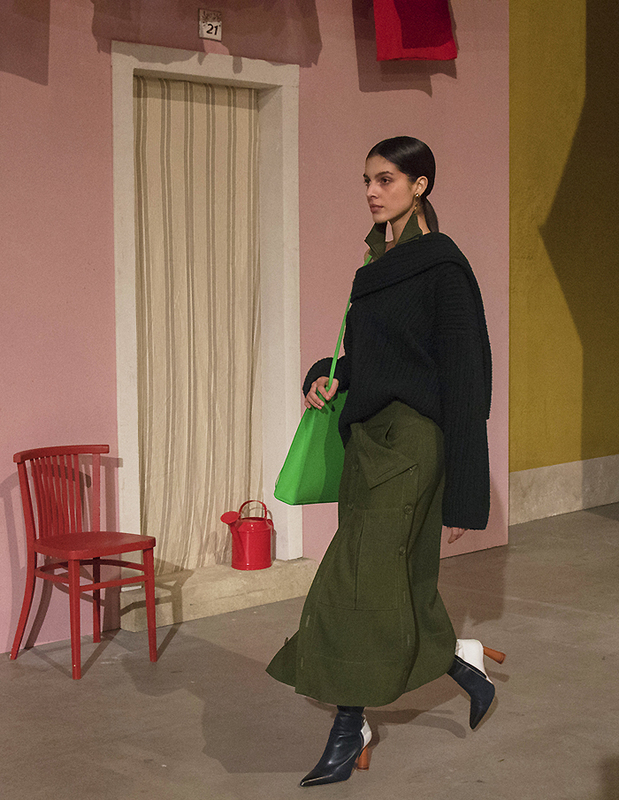 Accessories have been one of Jacquemus's strengths, including his bags and shoes. This season there were variations on the boot with some over the knee like waders and others with chunky, wooden heels. There were also belt-bags that were very commodious and these were contrasted with tiny, elegant handbags called the Mini Chiquito barely big enough for a lipstick. 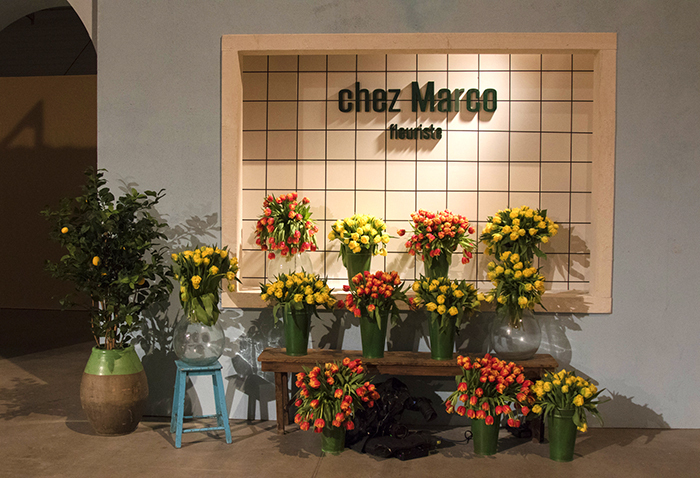 Born into a family of farmers, the designer grew up in a small town in southern France. This upbringing has always informed his work and the ochre colours of the South are found as a leitmotif through his work. Just over a decade ago, when he was eighteen, he left for Paris. He studied first at the École supérieure des arts et techniques de la mode (ESMOD) before leaving the program to work as a stylist at a fashion magazine. He began his own career as a fashion designer when he was twenty years old and created his brand Jacquemus, using his mother's maiden name. In 2012, he presented his collection during Paris Fashion Week. His work initially became known for the fabrics he used in his collections such as workwear textiles and a simple, unadorned cut with prints inspired by French films. 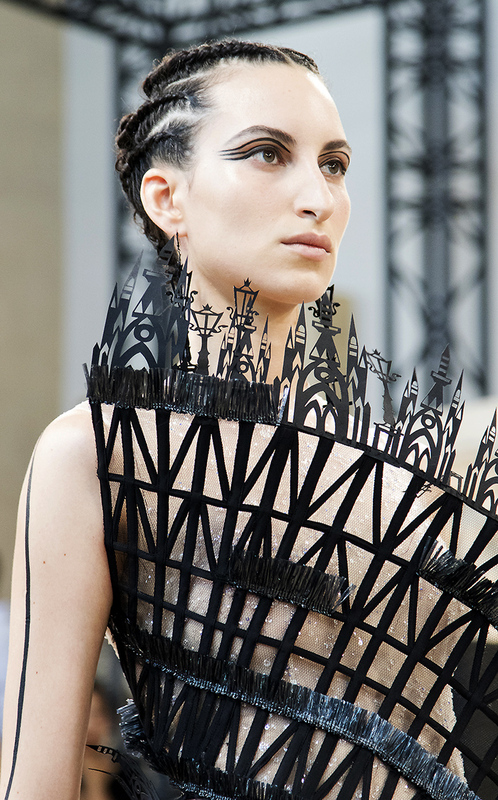 He has been hailed as an innovator with a new French egalitarian style that is both imaginative and highly wearable. 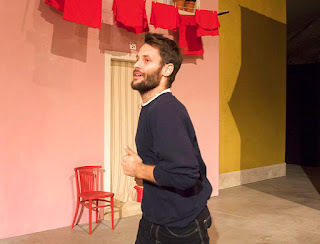 Jacquemus has received recognition for his work, including the Special Jury award by the LVMH Prize, an international competition created by Delphine Arnault for young fashion designers. 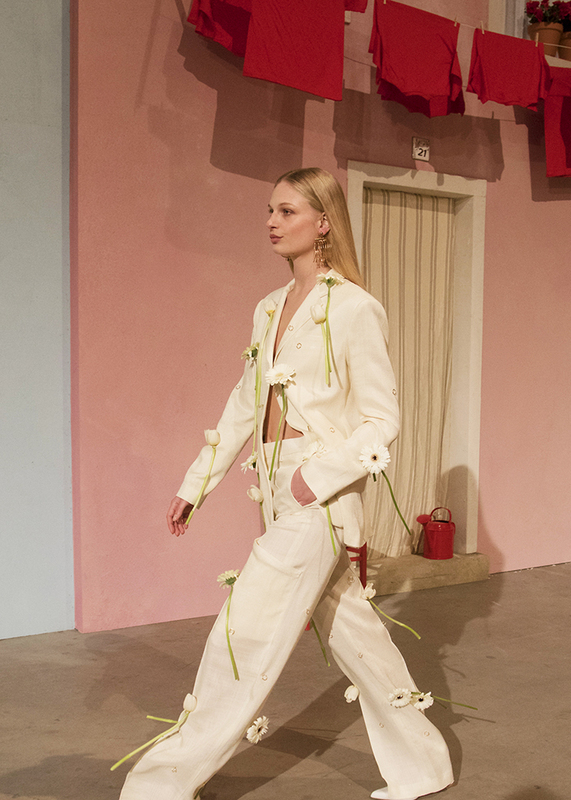 Two years ago, Jacquemus added a line of footwear to his collections which has been key to his shows along with handbags and some extraordinary hats, such as the enormous straw bolero that was seen in many magazine shoots. Building on his growing brand, the designer last year launched his menswear collection and had a very successful showing for his second outing last month with his take on workwear, shown at an informal breakfast where bread, croissants and fruit were eaten by guests and models alike. Amy Powney, Dame Anna Wintor, Caroline Rush CBE and Liz Bonnin. Photograph by Darren Gerrish. 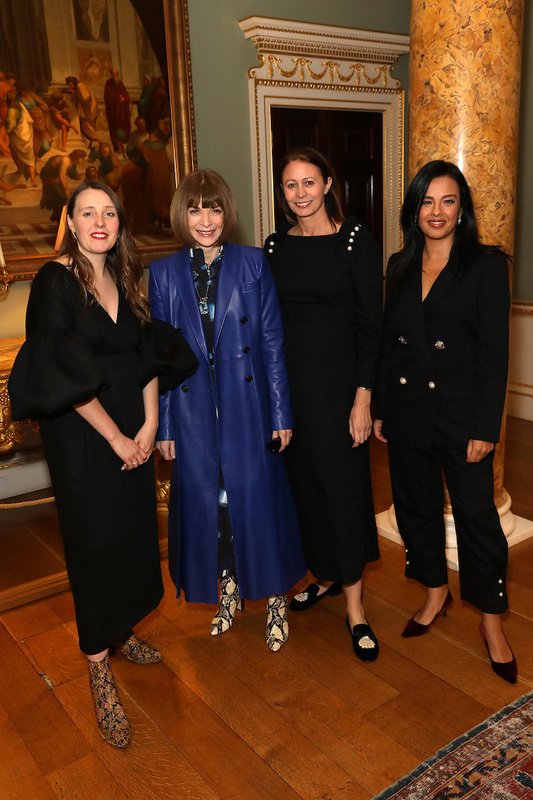 In London, the British Fashion Council celebrated their Positive Fashion collaboration with BBC Earth and Mother of Pearl with a cocktail reception and film preview at Spencer House, writes Antonio Visconti. Liz Bonnin, science and natural history presenter welcomed guests and introduced Caroline Rush, British Fashion Council CEO and Jackie Lee-Joe, Chief Marketing Officer for BBC Studios followed by the premier of a short film commissioned by BBC Earth from BBC Studios award-winning Natural History Unit on the tangible opportunity for sustainable fashion choices and mindful consumer behaviour. Amy Powney, Creative Director of Mother of Pearl closed proceedings with a heartfelt speech on the importance of collaboration. Caroline Rush, CEO, British Fashion Council said “At the British Fashion Council we recognise that now more than ever is a time to highlight the importance of pursuing Positive Fashion in the industry and keep it at the top of everyone’s agenda to drive change." 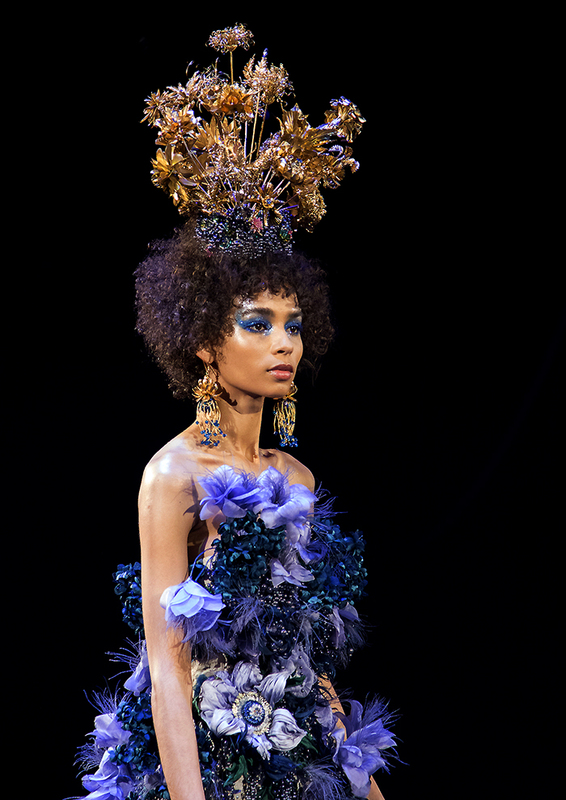 JEAN Paul Gaultier's ebullient and joyous new spring couture show reflects the success of his Fashion Freak Show cabaret at the Folies Bergere in Paris, now extended until April, and a new documentary coming out called Jean Paul Gaultier Freak And Chic. 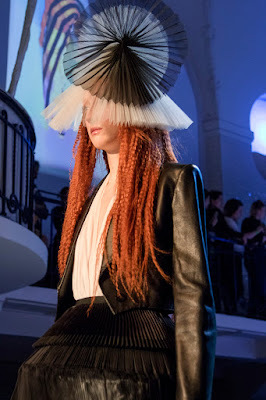 The new haute couture collection, shown at his headquarters in the Marais, began with glasses of champagne, adding to the frothy and celebratory atmosphere. 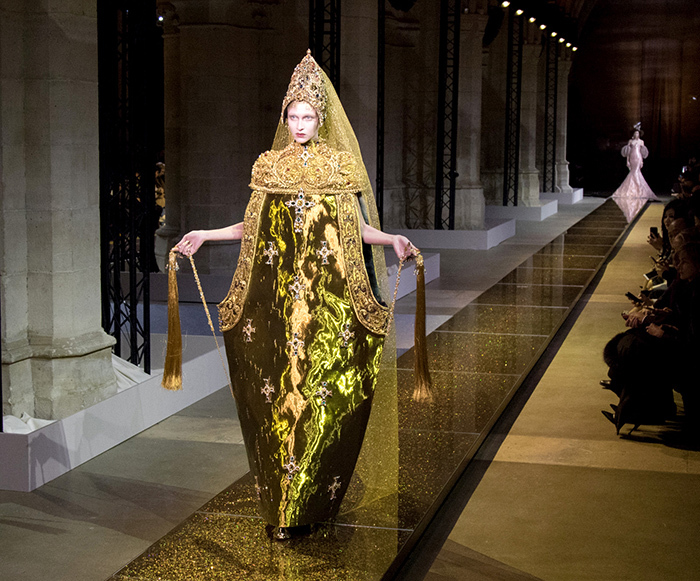 French actress Catherine Deneuve was seated in the front row and burlesque artist Dita Von Teese was on the runway in a sheer gown cinched at the waist (see at left). The designer said this collection was inspired by all things related to the deep sea and Japan. 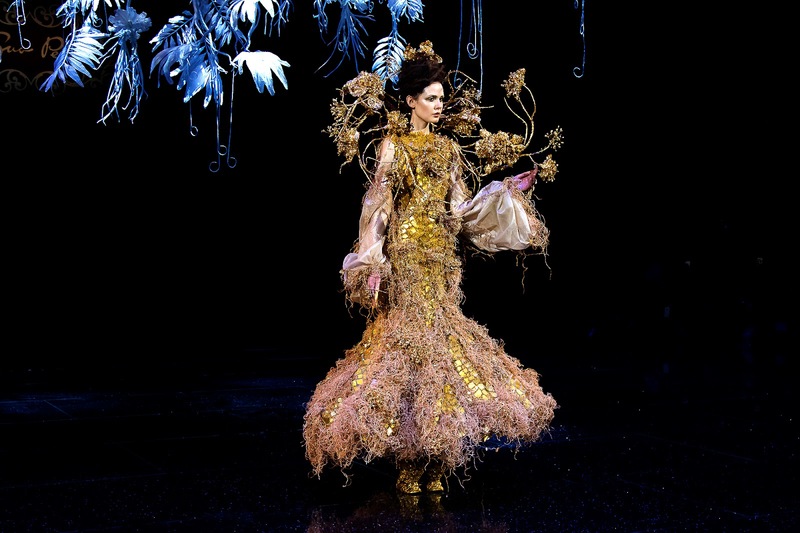 Many of the gowns' colour, texture and swirling movement reflect the hue and watery swirl of seaweed, coral and jellyfish. 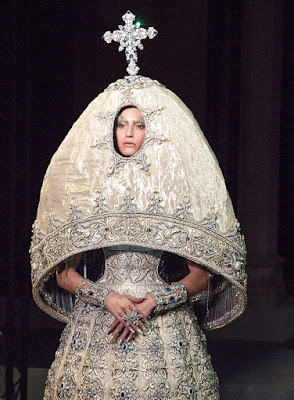 There was also a distinctly Japanese aesthetic mixed with high, pointy shoulders that Gaultier describes as "shark fins". 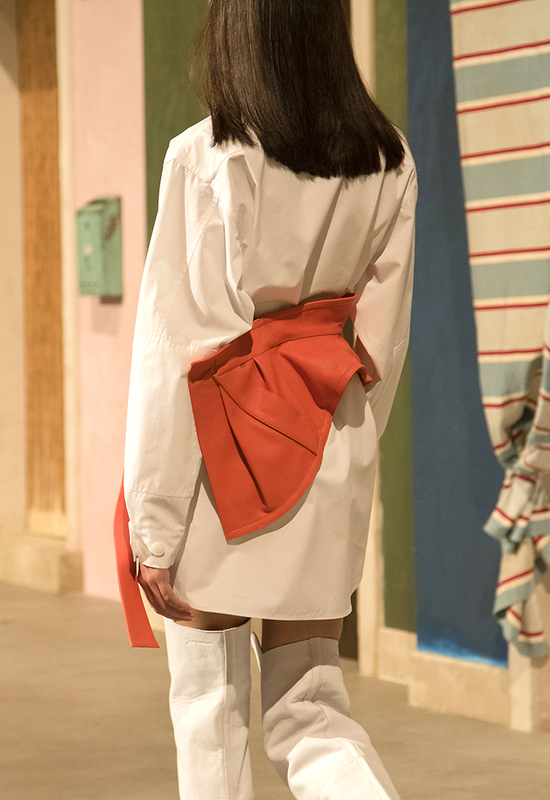 "There are some Japanese influences that are quite fascinating," the designer said backstage. "There are also lots of pleats ~ the whole collection is pleated ~ I even made pleated thigh boots." 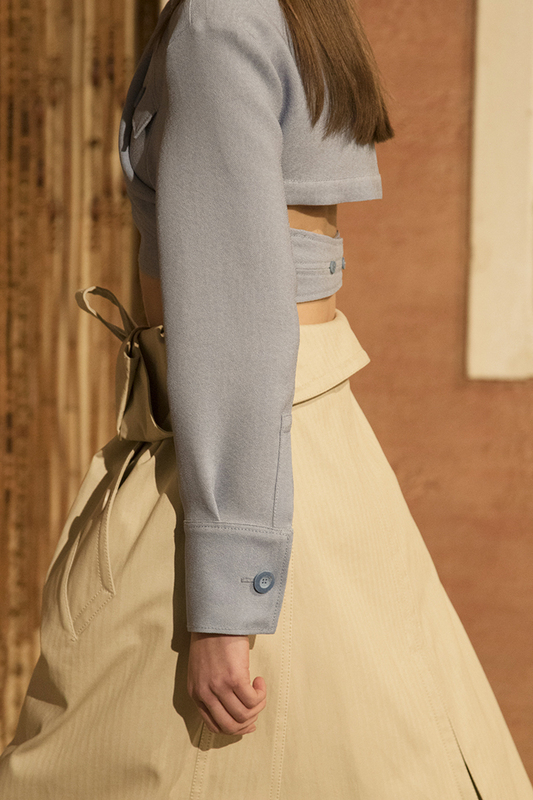 The key themes of the collection are transparency, pleats, 3D details and Japanese paniers. 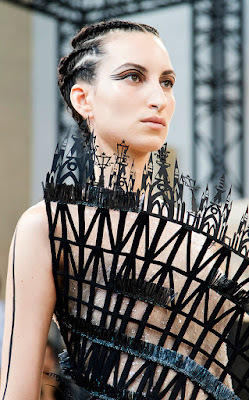 Gaultier also took the underwired corset and twisted it into new forms. "Normally the structure of crinolines is well behaved but I turned them around and spread them out," he explains. "We worked with three dimensions, especially with the embroidery. Inspired by Japan, the Japanese obi becomes a piece of clothing with reliefs that are in three dimensions with layers of bubbles. 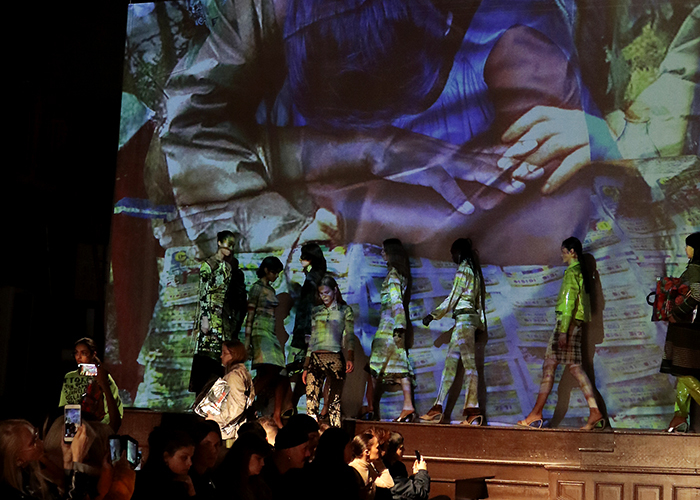 We play with transparency while using really light fabrics." "There are some Japanese influences that are quite fascinating. It’s also full of pleats ~ the whole collection is pleated and I even made pleated thigh boots"
Mr. Gaultier is well known for his signature French sailor look, the Breton top, and he created a new iteration of this for the opening look of the couture show with a diaphanous, striped blouse and a long, filmy gown in deep blue, pleated from the peaked shoulders down to the swirling skirt (see at right). Other motifs included beautiful pinstriped suits and shell-like dresses with the corset structure seen beneath transparent fabrics. The clever mix of fan pleats, high shoulders and stripes gave depth and three dimensionality to the whole collection. 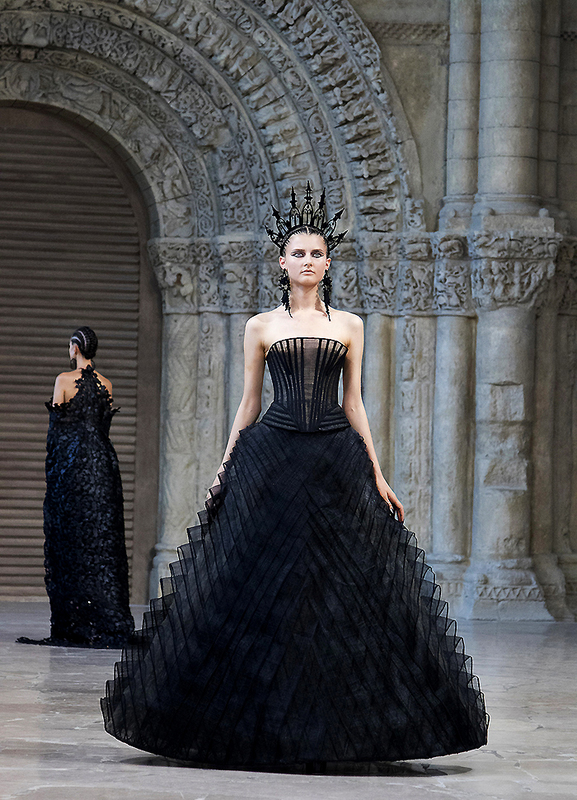 A black-and-white dress had stripes running up from the ankle to curving around one shoulder, that was deceptively simple but showed Gaultier's superb skill as a couturier (see below in the gallery). The designer's muse Anna Cleveland, who is also featured in the cabaret show, wore an organza, pleated gown with full sleeves and long, dark lapels (see below). Like the other models, she had vividly coloured, crimped hair that added to the sense of magical, sea creatures covered in sparkling jewels. 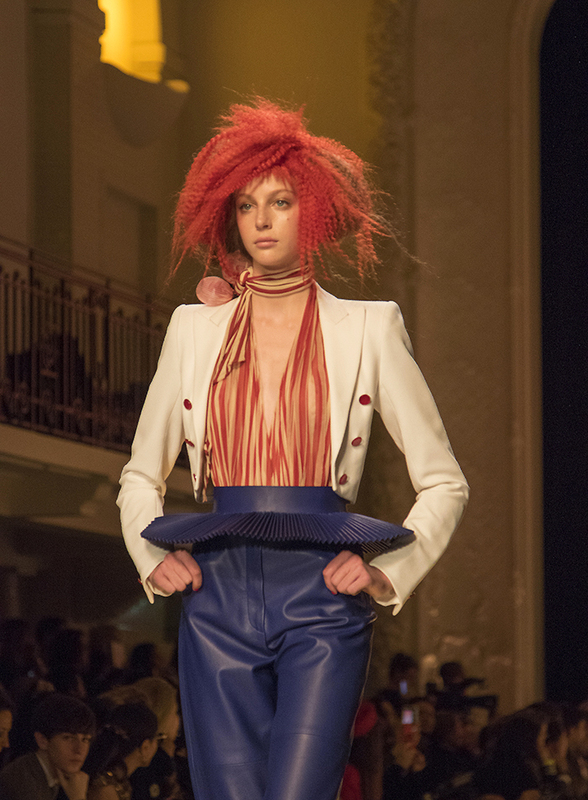 Overall the collection ranged from sailor shirts to corsets with hand-made details created in Mr. Gaultier's ateliers. Most of the suit jackets had the pointed "shark fin" shoulders and pleats were fanned across belts and ruffled along the top of tall boots. 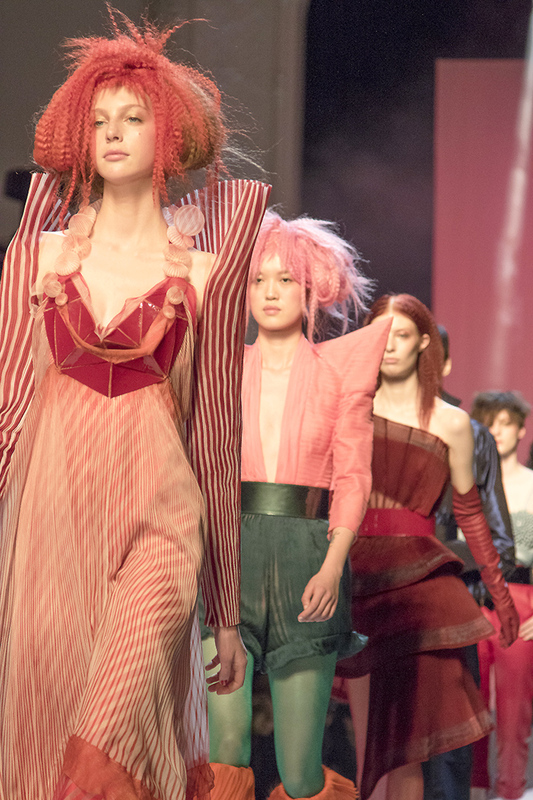 The sculptural corset dresses were overlaid with floating, opalescent fabrics and the brightly coloured striped pantsuits were mixed with long, draped gowns. 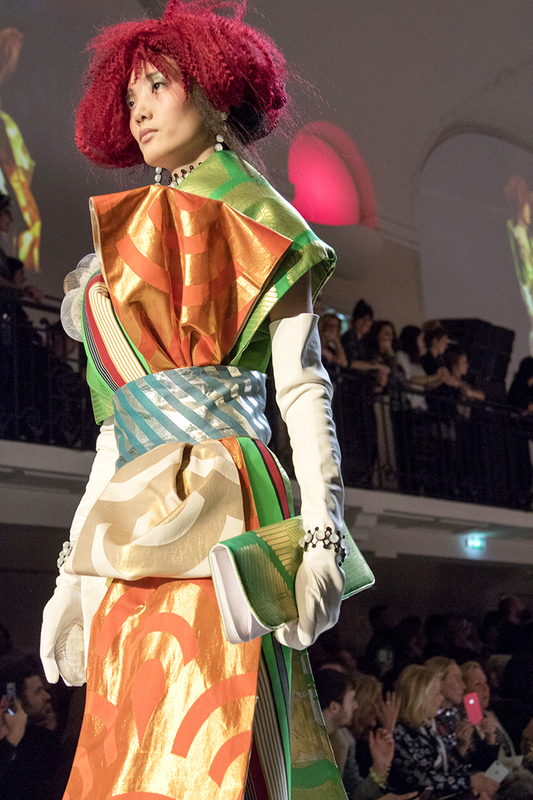 The punk geisha girls wore gleaming, bright fabrics with high waists and big bow ties. Coco Rocha wore a pale, sea blue hooped turquoise organza dress that seemed to move like a sea creature in water (see in gallery below). Dita Von Teese, who also made a cameo in Gaultier’s Fashion Freak Show, was one of the highlights of the runway show with her seductive swaying walk. Anna Cleveland closed the show in a jaunty white wedding dress shaped like an upturned Japanese lantern (see at left). Mr. Gaultier has found that his iconoclastic aesthetic, that shocked audiences as a young designer, is now part of the zeitgeist. His early collections worn by men and women featured models of different shapes, ages and ethnicity. He broke down stereotypes ~ but it has taken decades for the rest of the fashion world to catch up. The designer originally trained with Pierre Cardin and later at the Jean Patou fashion house. By the time he started out on his own in 1976, he already had a taste for runway shows that showed a wide range of different models who exuberantly wore his avant-garde designs. By the early 1980s, Mr. Gaultier had become well known for playing with traditional gender roles and his work inspired by streetwear and popular culture plus his use of models who were androgynous and tattooed and often didn't fit the rake thin frame considered the ideal in fashion. 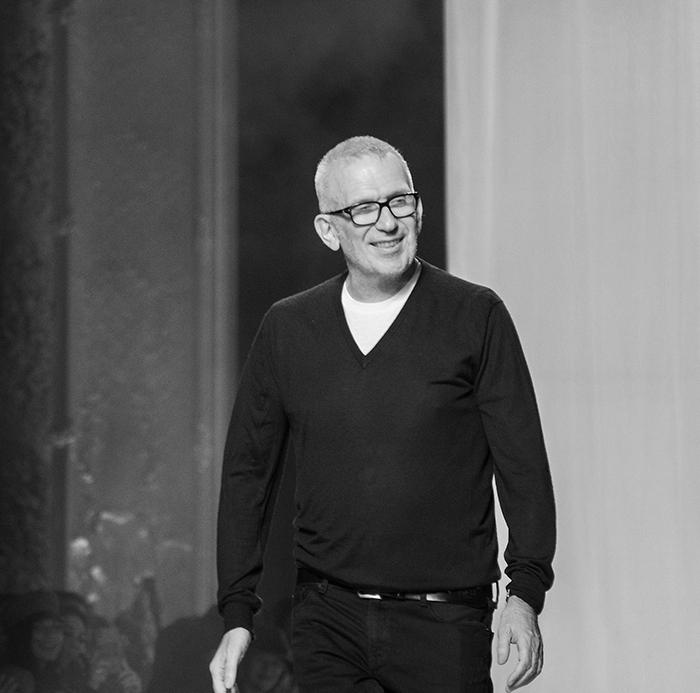 The new documentary Jean Paul Gaultier Freak And Chic, tells the story of Gaultier’s cabaret show at the Folies Bergères. Directed by Yann L’Hénoret, the film follows Mr. Gaultier for six months as he creates the Fashion Freak Show cabaret showing his life and career with clips from Madonna, Rossy de Palma and Catherine Deneuve. The cabaret show is produced by music producer Thierry Suc for the Folies Bergères and has had a full house every night since it opened to the public last October, now to be extended until late April 2019. Mr. Suc, who has worked with some of France’s best known musicians and artists, has said the show will be taken around the world, and depending on the country, will be adapted to appeal to local audiences. 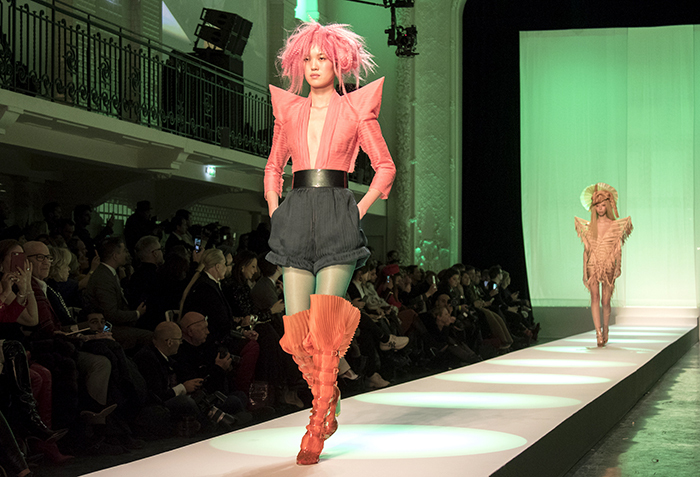 Mr. Gaultier approached Thierry Suc with the idea of the show and the pair worked together to create a cinematic experience combining cabaret with fashion shows and film. Cesar-winning Tonie Marshall co-directed the show and worked with Marion Motin, a dancer and choreographer who’s previously worked on Madonna concerts. Nile Rodgers, who has worked with Diana Ross, David Bowie, Madonna and Daft Punk, created the soundtrack for the Fashion Freak Show. The designer says the music from disco to funk and from pop to rock and new wave is a playlist that has inspired him throughout his life. Mr. Gaultier had always been enthralled by the Folies Bergere and the dramatic, glimmering costumes of sparkling sequins and feathers. The cabaret is Gaultier's own revue about his life seen through music and dance. Where the show is held is suitably historic, an Art Deco theatre that was remodelled in 1926, but founded even earlier in 1869. It is the right background for Mr. Gaultier's show and costumes, that includes the conical bra design that was created for Madonna’s 1990 Blond Ambition tour. 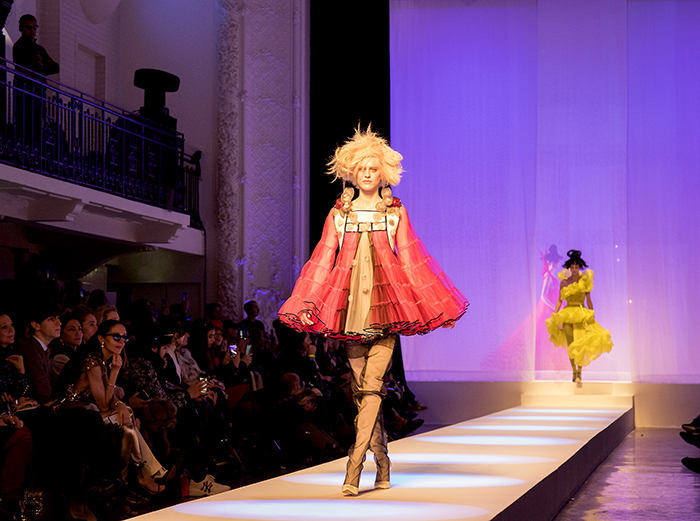 Some of the cabaret's scenes show the designer's early fashion shows that were more like theatrical events, given even more of an edge by his punk aesthetic and use of recycled materials. 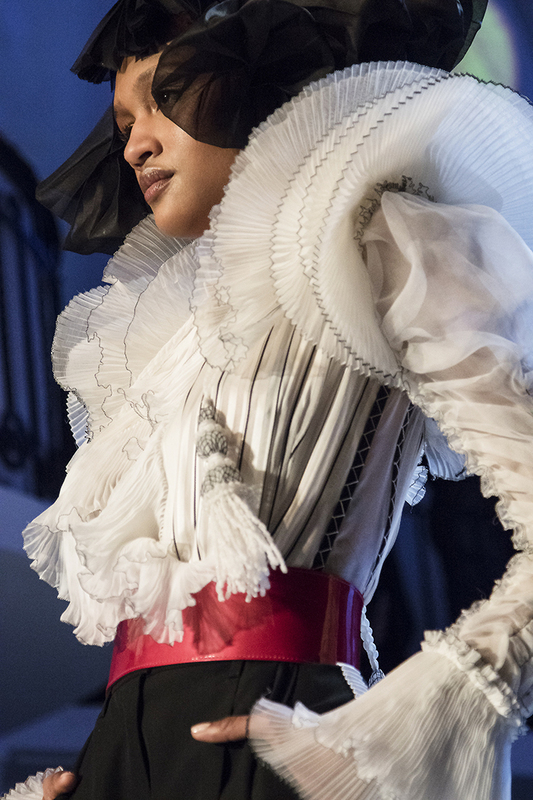 Mr. Gaultier believes it is a new form of theatre that combines both a revue and a fashion show and includes actors, dancers and circus performers with dozens of specially designed new outfits. He wants to take the audience on a journey from his childhood and early career to his most flamboyant fashion shows and nights spent at Le Palace and London.Video is part of the show and includes Catherine Deneuve plus Anna Cleveland, one of the show's ensemble cast, who makes striking, styled poses. 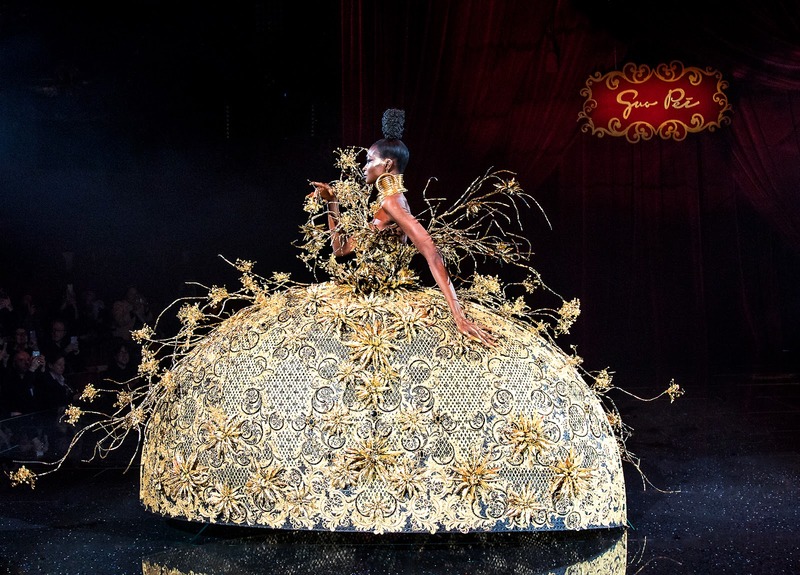 Like Mr. Gaultier's haute couture show in Paris, the cabaret at the Folies Bergere is suffused with the couturier's joie de vivre and creative energy that seems to reach out and embrace everyone both on stage and the runway and also those in the audience standing up in the aisles dancing and clapping to the pop anthems. 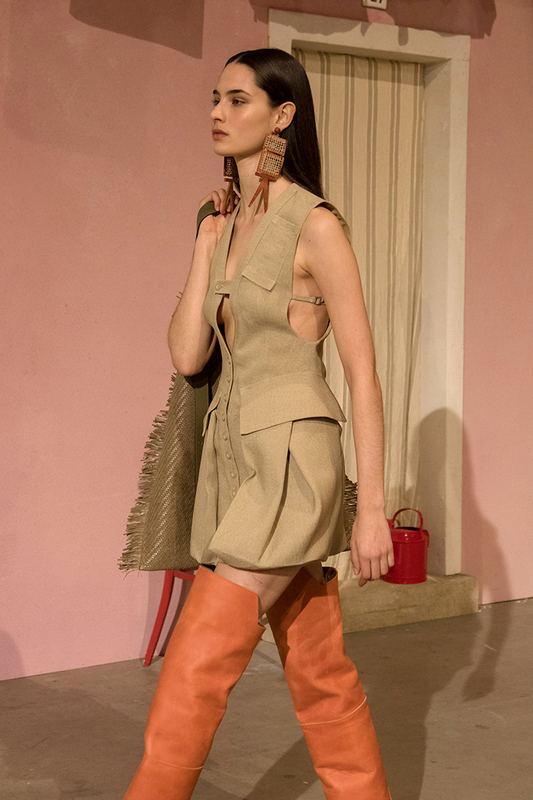 Who knew sharply pointed shoulders and finely pleated, high boots would make such an engaging combination?